Hoop is one of the many car artists featured in "Automorphosis." “The California Fantasy Van,” covered in 5,000 pieces of brass and $15,000 in coins, has rolled into New York City. “The film is an exploration of people who have transformed their car into rolling pieces of art,” said Hunter Mann, driver of the "fantasy" van built over a 22-year period by his godfather Ernie Steingold. Blank's van is covered with 2,700 camera’s including six functional Cannon cameras that shoot print film. The van also has two operational video cameras that transmit live images to four TV monitors mounted on the passenger side of the van. 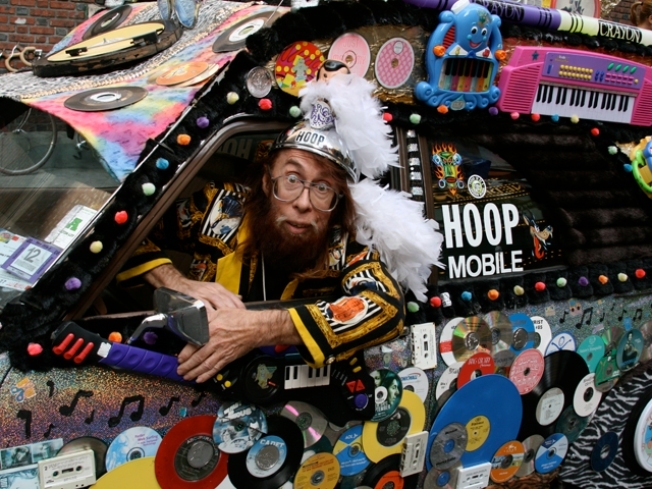 Hoop, a fixture in the art car scene who is also featured in the film, has been creating art cars he calls “Hoopmobiles” for 20 years. 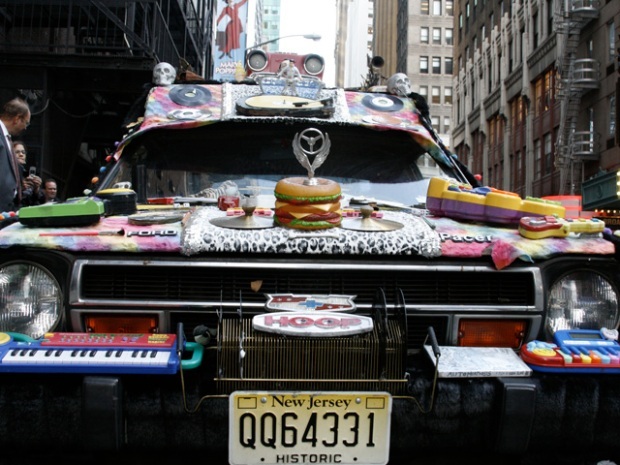 Hoop joined the small fleet of art cars on 41st with his “Music Mobile” covered in faux-fur, record players, 45’s, 8-tracks, CD’s and other music-themed items. The film will be screened during the Royal Flush Festival on Oct. 18 at 3:30 p.m. at the Anthology Film Archives in the East Village. Following the show, Hoop’s art cars will be included in an art show at Fusion Arts called “Art of the Crash,” which also features artists who create art using car parts. "People always love it," Hoop said as people stopped and stared at the cars, many pulling out their camera phones to take pictures. "I just keep trying to turn it out and make the people on the street happy."